You might really be wondering about this recipe. You may have never even heard of picadillo before, or if you have, maybe you’ve never had it. Let me let you in on a little secret – it’s delicious. It smells heavenly and tastes even better. It’s the ultimate Cuban comfort food and it’s one of my kids’ favorite recipes. This one always gets gobbled up in our house. Picadillo is a traditional dish in many Latin American countries and in the Philippines. It comes from the Spanish word picar, “to mince”, and consists mainly of ground beef and tomatoes. Each region adds its own little flavor, but the ground beef and tomatoes are the base. Costa Rica often adds bell peppers and onions, while the Dominican Republic adds hard cooked eggs, capers, cider vinegar and allspice. In the Philippines, Picadillo is much soupier and is often served with potatoes. In Puerto Rico it’s used as a filling for empanadas but is also served with rice and beans. If you still can’t really picture it, it’s really just the Latin version of Sloppy Joes. Everyone has their own regional way to make Sloppy Joes, which usually has the same basic ingredients as picadillo. Each recipe is a little different depending on where you grew up and how your mom made it. I typically make the Classic Cuban Picadillo. It not only contains the traditional ground beef and tomatoes, but it also has cinnamon and raisins for a little sweetness and olives to add a little salt. To keep mine Weight Watchers friendly, I skipped the raisins (which are high in carbohydrates and Points). I kept the traditional Cuban flavor by keeping the cinnamon. Olives are also higher in Points because they are usually high in fat. But I kept the olives because I really felt like it was worth the Points to keep the salty flavor of the olives. By keeping the amount of olives that I used relatively low, I kept the flavor but didn’t add too many extra points. One of my favorite parts of the recipe, apart from the amazing flavor, is that it’s really fast and easy to make. Sauté the onion and garlic, cook the beef, stir in everything else and then let it simmer while you get the rest of dinner ready. I like meals like this where the main dish is hands-off enough that I can finish the rest of the meal while the main dish is cooking. It really speeds up the cooking process. The Cubans usually serve their picadillo with rice and black beans, but my kids usually just have the rice with theirs. My husband and I usually have ours as is, but it’s delicious either way. You could also have a side of cauliflower rice with this, if you’re craving the rice, but without the Points and guilt. It’s also perfect for stuffing empanadas, quesadillas or wraps. This Classic Cuban Picadillo is fabulous. It’s delicious and simple, quick and easy to put together. There’s nothing exotic or expensive about the ingredients, so it’s perfect for a busy night. It’s truly satisfying and completely guilt free. I highly recommend giving this one a try! 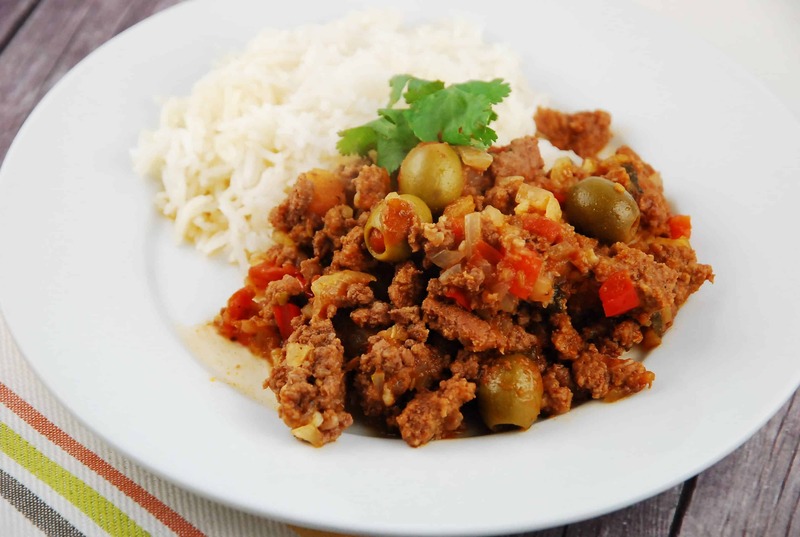 Get a mouthful of delicious Cuban cuisine with this traditional picadillo recipe! A soft and fragrant stew of ground beef and tomatoes, simmered with salty green olives. Heat oil in a large skillet over medium high heat. Add in the onion and garlic, and saute until slightly softened, about 3-4 minutes. Add in ground beef, and cook, while breaking up with a wooden spoon, until well browned. Stir in cumin, cinnamon, salt & pepper, bell pepper, tomatoes, bay leaves, vinegar, cilantro, olive brine, and olives. Cover and reduce heat to low; simmer for about 20 minutes. Same problem as above with not being able to print. When I copied and pasted to a Word doc, it would only print the ingredients and not the instructions. Can you fix this? Thanks! I cannot seem to print any of your recipes. The pictures prints when I press ‘Print Friendly’ but the recipe below it does not print. What am I doing wrong? The printer function didn’t work for me, either. I copied the text and pasted it into a word document to print. Looks great! Is it 5 on the new points plus? Or 5 on the old WW program? Thanks! This recipe is 5 Smart Points, which is the newest program. The ingredient list calls for two tomatoes but the instructions say to add tomato sauce. So I am confused. Many thanks for any clarification. We always love your recipes! Have you ever tried it with ground turkey? I haven’t, but I imagine it would work wonderfully!